While leading urban farming courses for the LA Museum of Natural History, Vanessa Vobis noticed that her attendees were mostly white families, many of whom already have access to healthy food options. To make these skills more accessible to diverse communities, Vobis approached a neighbor in the low-income community surrounding the museum, offering to build a home garden in exchange for the homeowner recruiting friends and family to help with the physical work and to learn about urban farming together. 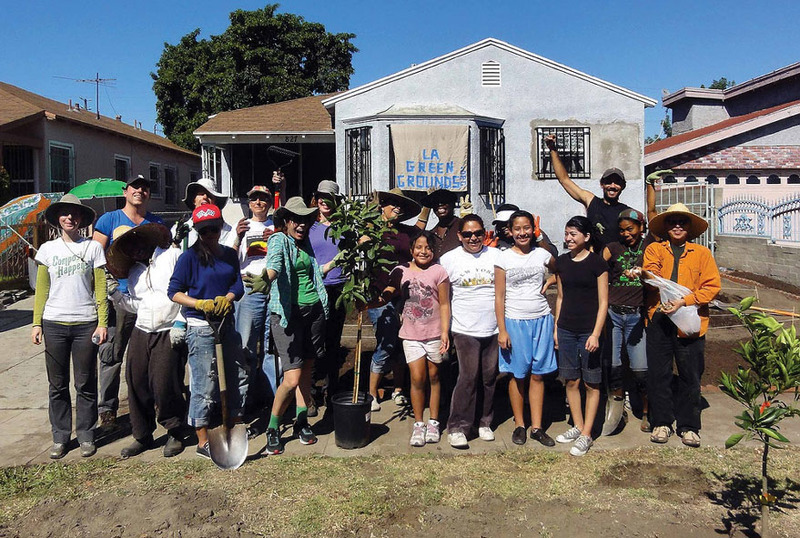 LA Green Grounds now holds monthly “dig-ins,” like old-fashioned barn-raisings, where residents work together to convert front yards into edible gardens in one day. Trained as an artist, Vobis sees participatory engagement as central to the work of socially active artists who attempt to resist the commercialization of the arts scene.